Bringing the US cartoon character's menacing treatment of poor old Mr Wilson to the computer screen, around the time of the film. 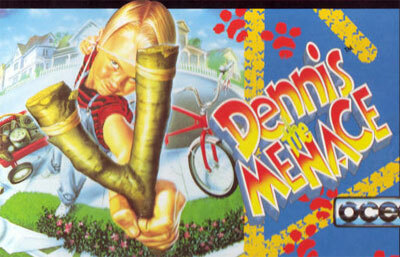 Dennis is a platform game across settings such as Sewers, the Park, and Mr Wilson's house, each of which has an end-of-level bad guy. The in-level opposition follows standard attack patterns, and can usually be avoided, and regenerate as you move on, although you generally only progress from bottom-left to top-right anyway. Some of the holes in the ground are deadly, while others lead to secret rooms. Fortunately, you are given up to 9 lives at the start, and lots of extra lives are on offer throughout the game, so these are well worth checking out. A choice between music and sound effects is offered.